The new Kindle DX is bigger, but is it better? If the excitement leading up to the introduction of the Kindle DX is any indication, you'd think Amazon would have the e-book market wrapped up and ready to deliver with a tidy pink bow. 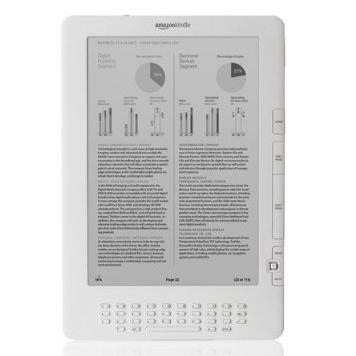 The latest in the Kindle line of e-book readers -- the new model sells for US$489 -- was unveiled at a news conference at Pace University by Amazon CEO Jeff Bezos. The emphasis was on how this new e-reader would allow college students to easily carry and access textbooks, and how ideal it is for larger-format periodicals such as newspapers and magazines. Despite the added weight, the Kindle DX is as comfortable to handle as its smaller predecessor. In fact, I found the keyboard, which is now somewhat larger and allows for more space between the keys, easier to work with; When I used it for a couple of searches, I get nearly the number of typos I did with the Kindle. In other words, the Kindle DX is not so much a revolutionary new addition to Amazon's product line as it is a perhaps useful niche product for academia. And it's too early to tell whether Amazon will be able to penetrate the market enough with its dedicated e-book reader to make it an everyday item for most people -- or whether less specialized products such as the iPhone or even an Apple netbook will predominate.